Shown $49.99Roses are designed to be delivered as close to the arrangement pictured as possible. Deluxe $59.99Larger roses are used for your arrangement. 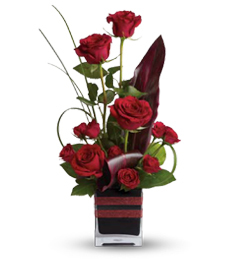 Premium $69.99The largest roses are delivered with a premium vase. Stylish and elegant, this unique array of red roses and spray roses, set in a beautiful black glass cube, radiates charm and grace. Sure to illuminate any room, these velvety blooms make for an aromatic and breathtaking token of your everlasting love and affection!